Happy 111th Birthday to the @USArmyReserve! We are proud of our citizen-soldiers providing @USArmy with the best trained and ready reserves in the world. Asking for a commitment from corporate America, Len Schleifer is proposing a unique and interesting way to break-through the funding dilemma we have on infrastructure. And it requires immediate action. Stephen Moore, like Herman Cain, poses a danger to the economic stability of our country. Mr. Cain clearly saw the writing on the wall and withdrew his name from consideration. Hopefully Senate Republicans will again voice their deep concerns and force Mr. Moore to do the same. Reports say @realDonaldTrump plans to set up a fake panel at the @WhiteHouse of cherry-picked frauds who question the reality of climate change to “counter” the massive scientific consensus. 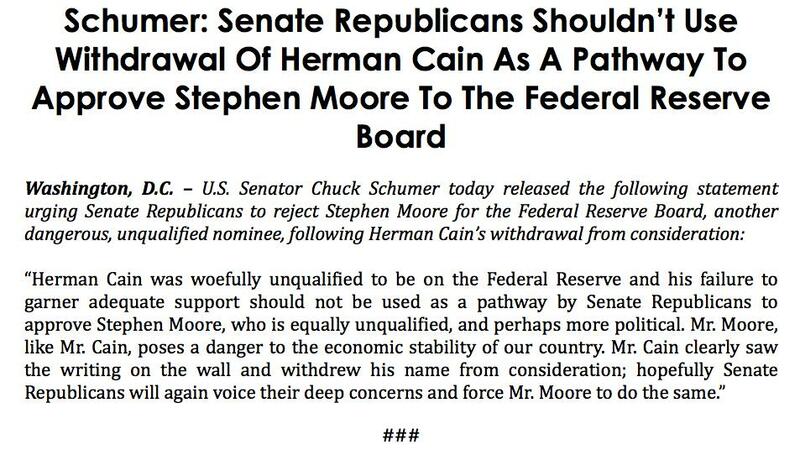 Herman Cain was woefully unqualified to be on the Federal Reserve and his failure to garner adequate support should not be used as a pathway by Senate Republicans to approve Stephen Moore, who is equally unqualified, and perhaps more political. Wishing I could be in Buffalo for the annual #DyngusDay festivities. Nothing says springtime like potato and cheese pierogi, some Krupnik, and the amazing Polish community in Buffalo.